I'm back... with a card!!! I've not had much time to create over the past few days - but tonight after the joy of seeing the USA and England go through into the quarter finals of the World Cup, I had to get upstairs and make something glittery. This CAS card uses a cupcake image from THIS digikit, and a simple typed sentiment. Love pink and kraft together. Lots of Doodlebug glitter on this one. Oh my word, that US game was such a nailbiter! I was so stressed I had to craft for a while! 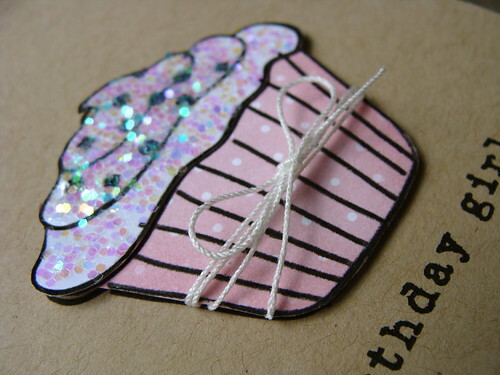 :) Love your sweet card...the colors and glitter are perfect! 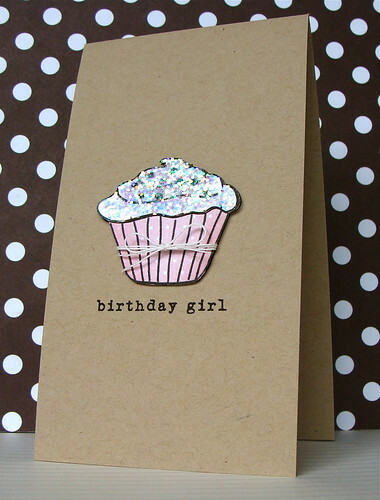 Love your sweet birthday card, the glitter is perfect! The World Cup is shaping up quite nicely, really tense times today though. So happy for both our teams. the cupcake looks so yummy with those glitters! lovely card! I think I need to get some of that glitter! Lovely card, Lucy! Pink and kraft really are wonderful together! I love this Lucy! Perfection! I don't think I've ever paired Kraft and pink - I love it! What a fun card! Thanks for sharing, and glad you enjoyed your visit! Hugs! As always, you make simple look fabulous. So excited about the World Cup. Unfortunately, we don't get to see the games in real time since they are on at 6AM here. By that time, we are off to work. Love seeing your glittery creations! This is CAS and oh, so sweet! Adorable card Lucy! Love the glitter! Such a yummy looking cupcake! You always make glitter look so good!